Unai Emery briefed the press on the state of his players as regards fitness after Arsenal clinched a 2-0 win over Southampton on Sunday afternoon. The Gunners cruised to victory over the Saints in a match they got hit with two second half injuries to move to fourth spot thereby reviving their hopes for Champions League qualification. After claiming all three points, the Spanish manager was optimistic about getting Stephan Lichtsteiner, Alex Iwobi and Ainsley Maitland-Niles back to full fitness in the coming days. 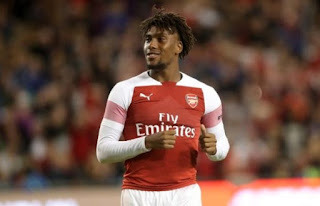 Iwobi made the starting lineup in Sunday's game in which he provided the ball for the second goal but could not go beyond the 75th minute as he limped off to be replaced by Pierre-Emerick Aubameyang. Emery hoped the Nigerian international could recover in time to appear in the side that will play Bournemouth by Wednesday. "I hope it’s only one knock and not a more important injury", the former Paris Saint Germain boss said. "I hope he can play Wednesday." Lichtsteiner also withdrew from today's game and just like Iwobi, Unai has confirmed it to be minor while expecting him to be available for the next clash. "Lichtsteiner has back pain but I think he can also be okay for Wednesday", he added. Maitland-Niles' battle with illness could be over already with the manager tipping him to be ready in the next three days. "I hope also Maitland-Niles can be ready for Wednesday."